The Theatre of Dreams and How Should I Change Mine? It’s almost 6 months since I moved my blog to WordPress and made a much more concerted effort to blog almost daily. I thought now was a good time to take a step back and review the progress and consider the strategy for the blog moving forward and I’m interested to know others views on the subject. When I started blogging more seriously I studied the blogs of several bloggers that I held in high esteem including Mericat, Canary Beck, Caitlin Tobias, as well as reading the brilliant resources on the SL Blogger Support pages. One of the subjects that comes up a lot, in my conversations with bloggers, the tutorials, the blogposts and advice is to ‘niche’ your blog. I know it’s Becky’s absolute number one piece of advice to bloggers and she has written on the subject many times. Becky advocates choosing an area of focus and sticking to it whether that be Home and Garden, Body Modification, Hair, Poses, Fashion etc. Choose one area and become an expert at it. As my blog has grown I’ve found myself developing organically with more home and garden sponsors than fashion, clothing or accessories. That’s not been deliberate it’s just the way things have worked out and so now I am considering whether to take the plunge and go one way or another. Or can I find the happy medium and still grow and develop my blog and it’s readership? I also think there’s an argument for my blog being semi-niched due to that and also because I’m a blogger that ‘talks’. I rarely picture blog (just a picture and credits) I like to talk about situations and subjects that interest me and hopefully engage the readers of the blog too. Well, for this post, I’m at least mixing up both! 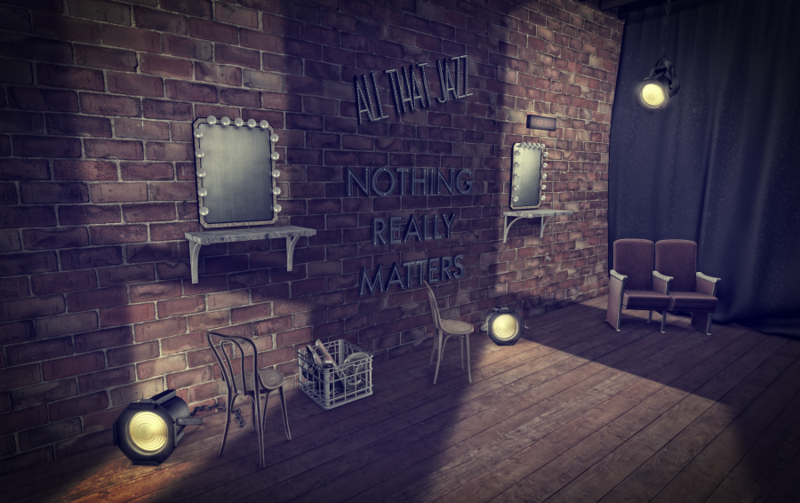 6th Republic starts today and after having a look around the sim yesterday while I helped set up the MadPea items, I can honestly say this event…the quality….the range…it’s knocks many other decor events out of the park. I loved putting together this look with the theme and room. 6th Republic is divided into two inspired areas – Chicago and California and the creators have really taken on the ideas and come up with some amazing products. White Widow have also hit the nail no the head with their new release for We ❤ Roleplay. Caravage comes in three colour/tint options – Black, Henna and White and in all the usual body appliers. I know many of you look forward to these amazing releases and are always happy to see new goodies from White Widow so jump on over and grab them quick! If you have any ideas, suggestions or thoughts on whether I should choose Mummy or Daddy or try to split custody or hell, even go live with a relative I would love to hear from you. Feel free to IM me in world (Kess Crystal) or leave a comment here.